What are the symptoms of a dry eye? What exactly is the tear film? What are some of the causes of a dry eye? Why do some patients with dry eye have excess tearing? The term dry eye, refers to a group of disorders of the tear film with a reduced tear production or excessive tear evaporation that are associated with symptoms of ocular discomfort and that may cause damage to the ocular surface. The cornea is kept moist by the lubricating effect of tears which are exchanged regularly with each eyelid blink. Tears are produced by 2 methods. One method (basic tear secretion) produces tears at a slow, steady rate and is responsible for normal eye lubrication. The other method (reflex tear secretion) produces large quantities of tears in response to eye irritation (foreign body) or emotions such as crying. The tears themselves are made up of a delicate balance of oil, water, and mucous; produced by various glands in the eyelid and conjunctival area. Dry eyes may be caused by changes in the quantity and/or quality of the natural tears produced by the various tear forming glands (lacrimal gland, meibomian glands, goblet cells, glands of Krause, and glands of Wolfring). 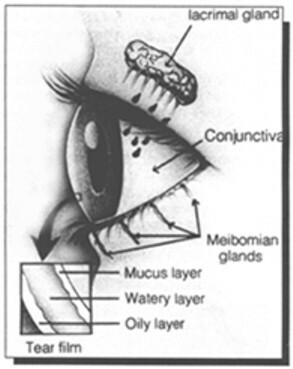 A film of tears is spread over the surface of the cornea each time the eyelids open and close (Figure 1). Tears are much different than water and are made of an oil layer, a water layer, and a mucous layer (Figure2). Figure 1 – Tears are made in the lacrimal gland and drained out via the nasolacrimal system (tear duct). Figure 2 – Components of the tear layer. Each component is important for a stable tear film. If one of the components is deficient, the tear film will be unstable resulting in ocular irritation. The oil layer is produced by the meibomian glands of the eyelid and not only smoothes the tear surface but reduces evaporation of tears. The middle layer is a watery layer produced by the main lacrimal gland and accessory lacrimal glands (glands of Wolfring and Krause) located in the conjunctival fornices. This layer cleanses the eye surface and rinses away foreign particles. The inner most tear layer consists of mucous produced by the goblet cells of the conjunctiva. Mucous allows the watery layer to spread evenly over the surface of the eye and help the team to remain wet. Without mucous, tears would not adhere to the eye. Tear production normally decreases as we age. Although a dry eye can occur in both men and women at any age, women are most often affected (especially after menopause). A dry eye can also be associated with arthritis and accompanied by a dry mouth. People with dry eyes, dry mouth and arthritis are said to have a condition called Sjogrens Syndrome. This entity is characterized by infiltration of the lacrimal glands and salivary glands with lymphocytes causing secondary compromise of the gland function. Women are more commonly involved then men. Patients with primary Sjogrens have non-classifiable systemic disease and symptoms that may include anthralgia, myalgia, or fatigue. Patients with secondary Sjogrens have a distinct autoimmune disease such as Rheumatoid Arthritis, Scleroderma, or Systemic Lupus Erythematosus. Diagnosis and treatment of underlying systemic immune disorders may decrease morbidity and may even be life saving. Rosacea is a disease of the skin and eyelid that is seen more frequently in fair skinned individuals, but can be found in all races. Characteristic facial skin changes include erythema, telangiectasia, pustules, prominent sebaceous glands, and rhinophyma. Meibomian gland dysfunction develops in the majority of patients with rosacea. Stevens Johnson Syndrome, Ocular Cicatricial Pemphigoid, chemical injuries, Herpes Simplex conjunctivitis, and other cicatrizing processes involving the conjunctiva may lead to scarring of the conjunctiva and resultant dry eyes secondary to an unstable tear film (goblet cells affected). Blepharitis (inflammation of the meibomian glands) is extremely common and associated with small bits of debris along the lash roots. With inflammation of the meibomian glands, the oil component of the tear film is affected. With a disruption of the oil component of the tears, an unstable tear film may result. Blepharitis may cause symptoms of irritation on its own but also is commonly associated with another disruption of the tear film (i.e. decreased production of the water component from the lacrimal gland). Patients that have both blepharitis and decreased lacrimal gland production are always worse than those with just one or the other. A variety of common medications (prescription and over the counter) can cause a reduction in tear formation and as a result, dry eyes. Examples include diuretics, betablockers, antihistamines, anticholinergics, psychotropics, some sleeping pills, and some pain killers. Since these medications are generally required, some level of dry eye may have to be tolerated by the patient. Excess tearing from "dry eyes" sounds illogical, but if the tears responsible for maintenance lubrication (basic tear secretion) of the cornea do not keep the eye wet enough, the eye becomes irritated (even though the patient may not feel this). When the eye senses dryness, a message is relayed to the brain (a reflex pathway) and then to the lacrimal gland to produce extra tears. This extra load of tears come on to the eye surface and overwhelms the tear drainage system. As a result they end up on the cheeks. This situation is referred to as "reflex tearing" and is quite common. Treatment of reflex tearing involves lubricating the ocular surface (with artificial tears) so this reflex pathway is not triggered. This same mechanism (reflex tearing) explains why people tear when they get something in the eye (e.g. eyelash). The excess tear production often flushes out the foreign body (lash). The tear break up time is determined by instilling fluorescein into the inferior conjunctival cul-de-sac and then assessing the stability of the precorneal tear film. The time lapse between the last blink and the appearance of the first randomly distributed dry spot on the cornea is the tear break up time. Dry spots that appear in less than 10 seconds are considered abnormal. Tear break up time is rapid for both aqueous tear deficiency and meibomian gland disease. The Schirmer test is performed by placing a narrow piece of filter paper into the inferior conjunctival cul-de-sac. Schirmer testing may be performed with or without the use of topical anesthesia. Applying topical anesthesia eliminates reflex tearing in most individuals and is the preferred method. After applying 1 or 2 drops of topical anesthetic, the conjunctival cul-de-sac is gently blotted to remove excess fluid. The Schirmer filter paper is then inserted into the conjunctival cul-desac and rests on the lid margin. Generally, less than 5 to 10 mm of wetting after 5 minutes is suggestive of a dry eye. Rose bengal is a topical dye that will stain devitalized epithelial cells. After applying Rose bengal, the ocular surface (cornea and conjunctiva) is examined for stained areas. Fluorescein dye stains degenerating or dying cells where there is sufficient disruption of intercellular junctions to allow penetration of the dye to the cornea stroma. An exposure-zone of fluorescein stain is often observed in the lower one third of the cornea. While most forms of dry eye cannot be prevented, appropriate treatment usually reduces symptoms while reducing or preventing permanent corneal problems. For those cases induced by medication (antihistamines, diuretics) and environmental factors (e.g. sitting near an air conditioner or heater), elimination of the offending drug or modification of the patient's home or work environment may be curative. Tears evaporate like any other liquid. In the winter, a warm dry environment often aggravates the dry eye. Humidifying the air with a cold mist or steam humidifier often eases some of the ocular irritation experienced by a dry eye patient. There are a variety of artificial tears available to supplement the patient's tear film. They all lubricate the eyes and help maintain the tear film. Some patients prefer one brand over another. Generally they should be used at least 4 times daily. Using them more often is occasionally necessary for severe cases. The addition of a lubricating ointment at night is another helpful measure for the dry eye patient. These lubricants (ex. Lacrilube or Hypotears ointment) produce a thick protective layer over the cornea during the night. The ointment is not used during waking hours because it will cause blurry vision. Conserving ones own natural tears is another approach and often used when artificial tears or gels are not helping. 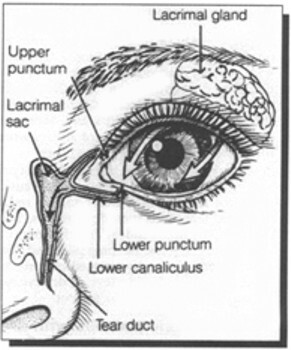 Tears flow into the nasolacrimal system via a punctal opening on the medial aspect of the upper and lower lid (Figure 1). These punctal openings may be temporarily blocked by placing dissolvable plugs within the canaliculus or blocking the opening of the puncta with a non-dissolvable tear plug. The openings can also be permanently closed with the application of cautery to the punctal opening or laser to the opening. Avoid sitting near fans, air conditioners, and forced air heating ducts. Adjusting computer screens to avoid reflections or lowering the computer screen to decrease the lid opening by having the patient look down at the screen also may be helpful. Scheduling regular breaks while reading may decrease the dryness associated with such activities. Wrap around glasses may reduce the drying effect of the wind. A smoke filled environment can be particularly bothersome to the dry eye patient and should be avoided. Patients with systemic disease such as Sjogrens Syndrome or Rheumatoid Arthritis should be managed in conjunction with a medical specialist, as control of the systemic disease often influences the dry eye. In summary - DRY EYES ARE COMMON. Although this problem more commonly affects the aging female it can occur at any age, male or female (it may even be congenital). Dry eye symptoms can wax and wane depending upon the etiology of the disease process as well as the environment (winter vs. summer). The dry eye condition is a life long process and may be progressive leading to increasing eye discomfort and requiring multiple visits to the physician. While the symptoms often improve with treatment, the disease usually is not curable and the chronicity of the disease may lead to patient frustration. One needs to learn how to live with the condition as it rarely resolves on its own.